Judge Joel Fahnestock was appointed by Governor Matt Blunt on January 6, 2009. Prior to her appointment, she was an Assistant United States Attorney in the Civil Division of the United States Attorney’s Office. She began her career as Law Clerk to United States District Judge Scott O. Wright, and then she joined the law firm of Rouse, Hendricks, German, May and Shank. She later joined the law firm of Shank, Laue & Hamilton and worked nine months in the Drug Unit of the Jackson County Prosecutor’s Office. Judge Fahnestock is a member of the Missouri Bar and several professional associations. Judge Fahnestock received recognition for her outstanding work and contributions to the United States Attorney’s Office in both 2007 and 2008. She received the UMKC Outstanding Academic Achievement Award; the National Association of Women Lawyers Award; the ABA National Trial Competition Award; the Clark Boardman Callaghan Award for Exemplary Third Year Student; and several American Jurisprudence Awards. 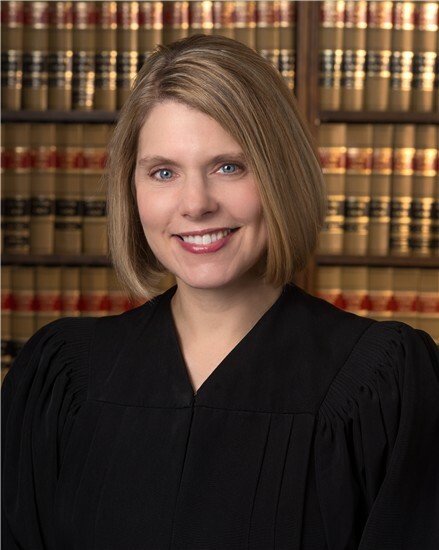 Judge Fahnestock also serves on several statewide committees including the Missouri Court Automation Committee, the Implementation Planning Task Team (Chair), the Trial Judge’s Focus Group, and the Case Management Oversight Team. Judge Fahnestock graduated from William Woods College with a Bachelor’s degree in English Communications. She obtained her Juris Doctorate from the UMKC School of Law, where she competed on the trial team and served as a Note Editor for the UMKC Law Review.